Work on the new bicycle and pedestrian underpass in Northampton is nearing completion. Last week the contractor was working on the final grading and hardscape work at the site. Paving of the access ramps on either side of the underpass would appear to be next. It would appear that MassDOT and its contractor for this project Northern Construction are well on their way towards completing this project on-time. 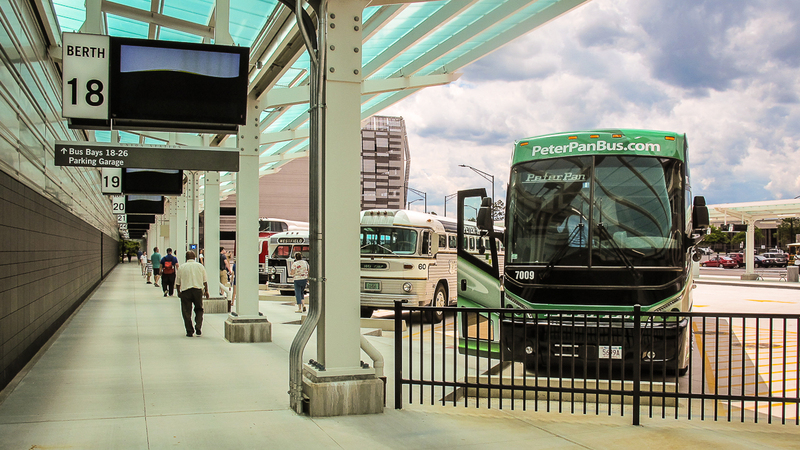 Peter Pan Bus Lines has announced that they plan to move their regional hub to Springfield Union Station on Wednesday, September 6th, 2017. On this date all Peter Pan and Greyhound bus services and ticket sales will move into the newly renovated Union Station complex. People have asked about the cost to park at the new Union Station Garage in Springfield. 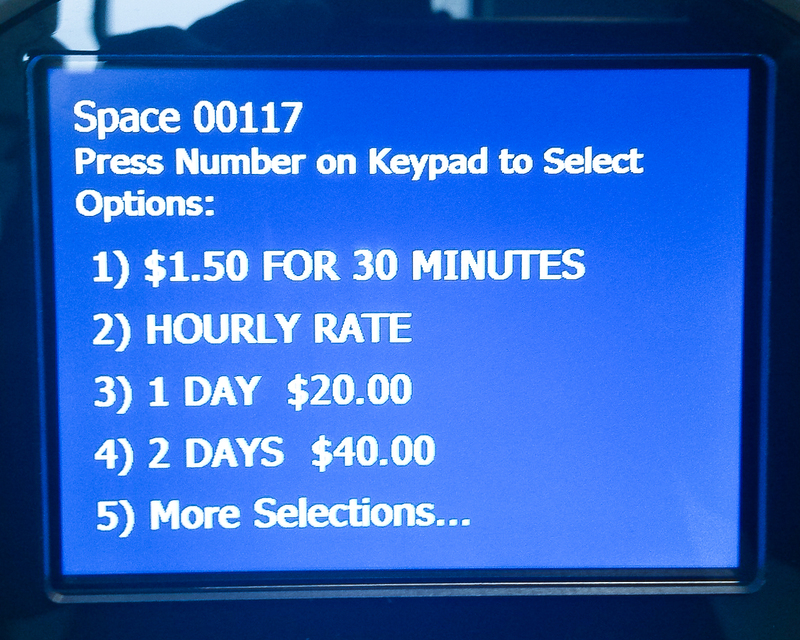 The parking rate is calculated as $1.50 for the first 30 minutes and then $2.00 for each additional hour — up to a maximum of $20 for the day. Longer term rates are also available. 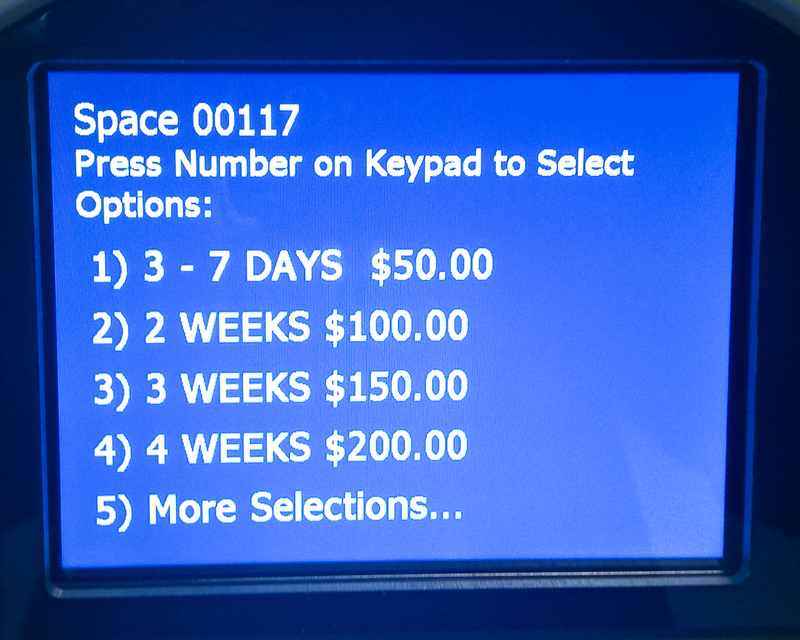 The current rates are shown on these display screens on each parking kiosk at the garage. Note that Ken’s Parking, at 73 Taylor Street, has a day rate that starts at $10. In July 2017, the NHHS Rail Program captured the Track Construction Machine (TCM) in operation as it layed new track in Berlin, Connecticut. By utilizing an unmanned aerial vehicle, video crews were able to provide the public with a “bird’s-eye” view of the 250-ton machine, which can assemble up to 1,000 feet of track per hour in ideal conditions, totaling over one mile of track per day. This summer the TCM layed ten miles of new track between Meriden and Newington. Later this fall, it will return to lay an additional four miles of new track between Hartford and Windsor. The CTrail Hartford Line commuter rail service — which will operate between Springfield, Hartford and New Haven — is scheduled to open in May 2018. Transit Oriented Development (TOD) projects take off near future CTrail Hartford Line stations in Connecticut. The area north of Springfield Union Station, with its many surface parking lots and single-story commercial structures, is an obvious location for TOD. This page was updated with the most current version of the “Public Highway-rail Crossings Ranked by Predicted Accidents report” for Franklin, Hampden, and Hampshire counties (as of 12/31/2016). The report shows that there were a total of four reported accidents at public railroad crossing in the Pioneer Valley during the five-year period from January 1, 2012 – December 31, 2016. The page has been updated and refreshed. We have also added our 2Q2017 financial report.